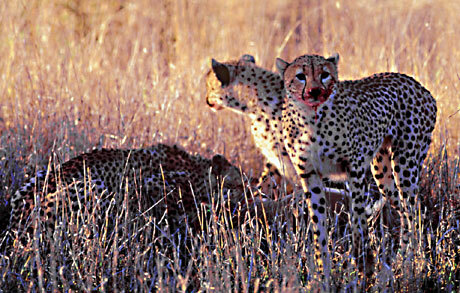 Three cheetah (below) had just killed an impala and were starting to feed as we arrived on the scene in South Africa's Kruger National Park. This was a rare sighting and a first for me. 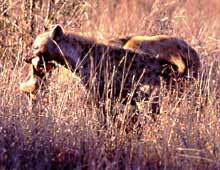 But hardly had we settled down to watch the cheetah enjoy the fruits of their labour than one - then another - hyena materialised like unwelcome ghosts from the bush. 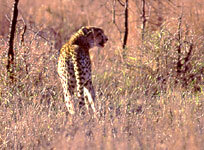 Within seconds there were half a dozen - too many for the mild-mannered cheetah to confront, so they reluctantly retreated (below). Then the frenzy began (below). 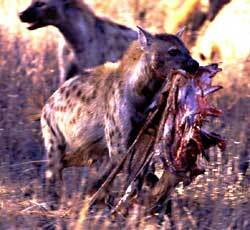 Snapping, snarling and yelping, the hyenas ripped the impala apart, swallowing huge chunks of flesh and bone. 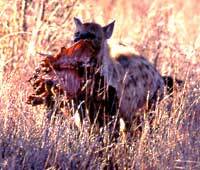 Those that managed to tear away portions too big to swallow scurried away with their loot, before it was snatched away. 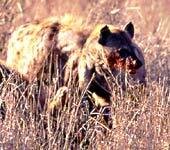 Within minutes it was over - nothing left but some bloodied grass stems. 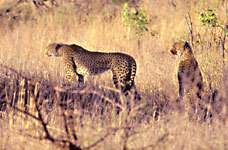 As for the cheetahs - well, they are extremely successful hunters, catching half the prey they chase. 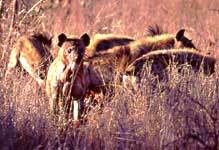 They are also fairly placid and prefer to retreat from a kill when confronted by hyena, particularly as an injury would hamper their ability to hunt. Better simply to leave and try again later.